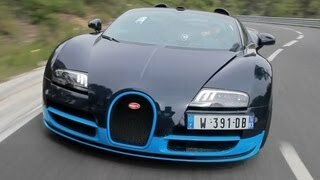 The Bugatti Veyron has been and still is without shadow of a doubt the most astonishing super car ever built. It's basically a "no compromise" super car, meaning that it's the fastest production road car ever build as well as the fastest road car on a racing track, but it's also the most civilized one. It has air conditioning, leather upholstery, a stereo, and can be driven on a normal road without any impediments whatsoever. Unfortunately Bugatti has stopped producing the original coupe version of the Veyron, but has recently revealed the limited edition Bugatti Veyron 16.4 Grand Sport Vitesse during this year's Beijing Auto Show. The Grand Sport Vitesse boasts a 1200 horsepower, 1,106 lb-ft of torque 7.9 liter W16 engine that delivers a top speed of 255 mph (410 km/h) and can go from 0 to 62 mph in just 2.6 seconds. These numbers make the Bugatti Grand Sport Vitesse the fastest production roadster ever built. The difference of roughly 200 horsepower and 180 lb-ft of torque between the 2008 Grand Sport and the Vitesse is obtained due to four larger turbochargers and brand new intercoolers. In addition, the Vitesse features reinforced drivetrain components in order to safely deliver the jaw-dropping power to all four wheels. Obviously due to the roadster nature of the Vitesse, the chassis had to be reinforced and reconfigured, and the results are astonishing as the limited edition handles even better in the corners, and can deliver maximum lateral acceleration of 1.4 G in the corners without losing grip. The braking system has also been improved and now features larger air intakes. On the exterior the Grand Sport Vitesse has obviously not been heavily modified, but it now has a new retractable windbreaker at the back and a lighter set of brand new 20-inch alloy rims. Other notable changes consist in larger air intakes on the front bumper and a double diffuser and a twin tailpipe positioned centrally at the rear end. Inside we find lots of carbon fiber, alongside aluminum and magnesium elements on the center console extension and the door inserts just to name a few. Furthermore the Grand Sport Vitesse will come with bi-color trim parts and a special seat design, but more interestingly it offers endless individualization options, making all of the 350 Grand Sport Vitesse unique in their own way. As far as pricing goes, the Bugatti Veyron 16.4 Grand Sport Vitesse is to be sold at the price of 1.58 million Euros, and as far as competition goes, only a handful of super cars can get into Veyron territory, such as the Koenigsegg Agera R and the less powerful Pagani Huayra.